Being choosy when it comes to picking a mate is beneficial for females. Being able to choose a (good) father for their offspring may allow females to produce fit and attractive offspring. This is particularly important for female spotted hyenas, because they invest more in their young than most other land-living carnivores. They usually give birth to only one or two cubs at a time and nurse them for a very long period. For mothers with such high investment it is crucial to choose fathers that maximise the survival of their offspring. Female spotted hyenas have the power to choose their mates. First, females spotted hyenas are socially dominant over most males (mostly immigrant males) and can thereby reject any male they do not want to mate with. Second, the masculinisation of the females’ external sexual organs into a ‘pseudopenis’ forces males to mate in a very instable position; a successful mating requires the full cooperation of the female. Unlike most other mammals, female spotted hyenas cannot be forced to mate and have complete control over copulation. Having a pseudopenis therefore provides substantial benefits to females by allowing them to choose the father of their offspring. And female spotted hyenas have clear ideas about who they want to mate with. Females avoid incestuous mating with close relatives. Our genetic paternity analyses of more than 1000 cubs showed that young females preferably choose males that were born into the clan or that immigrated into the clan after the female was born. This simple rule ensures that females efficiently avoid breeding with their father and older brothers, thereby reducing the risk to produce unfit, inbred offspring. Females additionally favour ‘friendly’ males and older females prefer males that have built friendly relationships with them over several years. Males therefore invest a lot of time in developing friendly relationships with females and sometimes follow or ‘shadow’ them continuously over weeks. 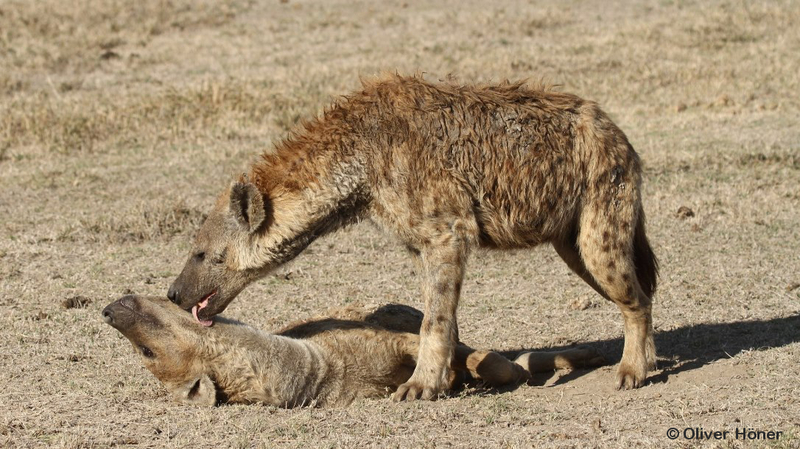 These female mate-choice rules have strong implications for the reproductive strategies and life history of male spotted hyenas. Davidian E, Courtiol A, Wachter B, Hofer H, Höner OP (2016) Why do some males choose to breed at home when most other males disperse? Science Advances 2: e1501236. Höner OP (2013) The Power of the Alpha Mothers. German research, Magazine of the Deutsche Forschungsgemeinschaft 1/2013: 16-21.